The bike originally started life with a standard CB400F motor in a heavily modified RD250 frame with alloy wheels and discs. Yamaha forks and home made rear sets. It was awful. So a total rebuild was decided, (after rebuilding many historic mini's this task was thought!!! 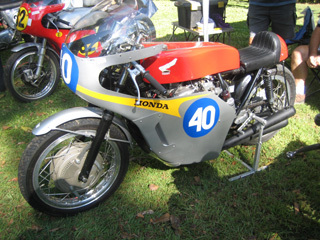 to be quite easy) A Honda Redman/Hailwood replica was the model chosen ( as I was at the Isle of Mann in 67 ). Akron rims and stainless steel spokes were sourced and a new 9 inch Grimeca 4ls hub was purchased from AJS motorcycles in the UK. The rear was a standard unit, polished wheels were rebuilt by Hagon Shocks and fitted with Bridgestone BT45 tyres. Rear sets and levers were sourced from Barley Corn Engineering, Gold Star Clip ons and a twin pull lever was again purchase from AJS in the UK. By this time it was starting to show some promise. The old RD250 frame just had to go and a 350F frame was finally found that was straight. The trusty grinder soon made short work of all the road going brackets and the frame, swinging arm and yokes were powder coated and all new bushes and bearings fitted to the swinging arm, head stock and axles. 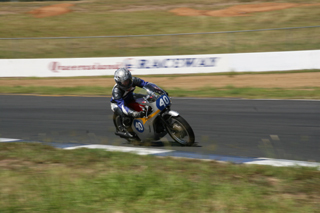 Robbie by this time had purchase a Suzuki 600 and thought the old Honda was just for old men living in times gone by (ask him now) Web Cams could supply camshafts for the 400F but it was thought if were at this stage we would see what Mr Yoshimura had lying around. We finally located a NOS ST2 genuine Yoshi cam, valve and springs from Japan along with alloy top yoke and a modified set of 54.5mm pistons giving it 10.45 compression and the final chapter was a genuine signed Yoshi block bore at 466cc, (signed on the top of the cylinder block) This was a bit like having all your Christmas's come at once. The bottom yoke was line bored to accept 35mm to match the top yoke and CB650 forks fitted, the forks have had all the disc carriers and caliper brackets machine off, the legs were refurbished and all seals replaced, the head was ported and polished by my Mini friend in Sydney (a genuine genius) and rebuilt with cam, valves and springs, Boyer Bransen total loss ignition complete with coils and a complete new wiring loom was fabricated along with new cable. To ease starting the starter motor was retained and a starter, kill switch etc was acquired from a Ducati 750. Tomasselli quick action throttle (single cable only) and the carbi's were cleaned using ultrasonic tops and the float bowls were polished and fully kitted with 90's on the mains, fairing came fully refinished from Dream Machines with all period graphics and number boards. As I came from Lancaster UK (originally) Dave Swarbrick mega's and headers 4x4 were installed and we were almost finished. A high velocity oil pump was considered, however on advice it was suggested that if the oil and filter were changed regularly this was not really necessary it seemed ready to go. Initially it ran sort of OK but plug chops were on the lean side. After a few days of fiddling we changed to 110 mains and 40's on the slow seemed to be the best mix. Although cold initially, once it warms up it seems to be everything we had hoped for. Robbie was very skeptical the first time at Queensland Raceway as he thought the brakes were a bit like his Dad "too old". He soon changed his mind after the first shake down session when he was smiling from ear to ear, “this thing really stops he said”. We were over geared with a conservative 38/17 fitted, since then a 16t has been fitted for Cootha and although it was snappier a 42t will be installed for Stanthorpe. Along with baffles (for those who are not already of limited hearing) as the 466 with all its Yoshimura parts is not fragile, most of it would now be extremely hard to replace. For fear of being taken out of the will Robbie has been instructed not to throw it down the road (only joking) A Web #69 cam is on its way from Texas c/w the appropriate valve springs and a very nice 350F is now in the design stage, the head is already in Sydney and valve and porting is being worked on, a set of Keihin CR's will be used so we can be in period 4 and really chase those oil burners.